As we approach the launch of Madden 13 it should be noted that EA Sports still has exclusive rights to the NFL license. There are a few things in gaming that truly drive innovation and the primary motivating factor is true competition. 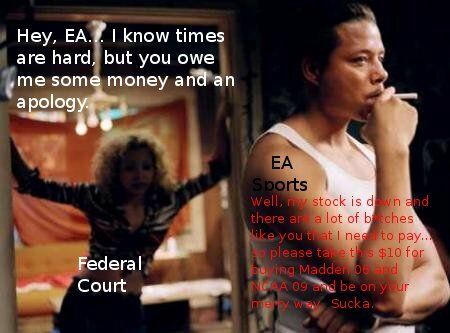 EA has found out the hard way that monopolizing the market to fix prices is the wrong way to go about this not only with fans of sports gaming, but now with the Federal Court system. For a detailed run-down of the decision check out this article at Kotaku. If you want the real moral of the story, it is that EA Sports will be banned from exclusive deals ONLY with NCAA Football and Arena Football League. Which in all honesty is simply a slap on the wrist. The real competition they faced was from 2K in the NFL 2K series. What this really means is that you shouldn’t hold out hope that 2K (or any other developer) will get a chance to make an NFL game. However, if they do get that chance, it will probably be on the next generation of consoles (if ever). What about the Class Action Lawsuit? In terms of what you ‘get’ out of it… $2 for any 360, Wii or PS3 American Football Title (AFL, Madden, NCAA) and just under $7 for PS2, Gamecube and XBox games that came out after 2005. EA Sports is being hit where it counts – the wallet. This isn’t the type of punch in the face that knocks them out of Exclusive Rights in sports gaming, but it is a sign that what they have been doing isn’t right. EA has potential to make some of the best sports games out there and when they had to fight against NFL 2K5 it was the best iteration of Madden (2005) ever. In 2005 it was like watching Rocky 2. Two developers were busting their asses trying to prove that they had the best game out there. In the end you see both of them fall to the ground in the last few seconds. 2K5 came out with a great game for $20 and after seeing this, EA released Madden for $30 rather than $50. EA came out on top and then just like Rocky they were the world champs. Then after 2005, EA Sports turned into Rocky in Rocky 3. They got lazy and lost a lot of their motivation to train hard. They started doing stupid promotions and simply got full of themselves because everyone they would fight would be a push-over (if there was anyone to fight). While it seems that we might not like EA Sports games… it is to the contrary. We love EA Sports titles, but we loved them more when they were trying harder. It isn’t fair to EA Sports that they have no competition, it makes them look soft and it prevents them from improving. We want to see a good fight between developers that makes us get excited again.